The chart above, from Credit Suisse’s global outlook for 2015, perfectly explains why so many investors are looking more favourably at European stocks. 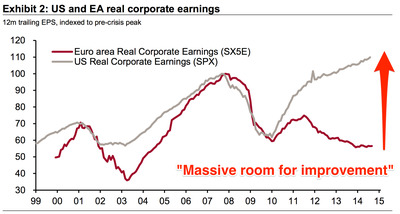 Europe’s corporate earnings are near a 10-year low, while US earnings are smashing through new records. European stocks may present a good opportunity because they have neared the bottom — there’s nowhere to go but up if the economy improves, even slightly. If global growth improves, the economies with the largest output gaps — such as the euro zone — may see risky asset prices bounce sharply from depressed levels. 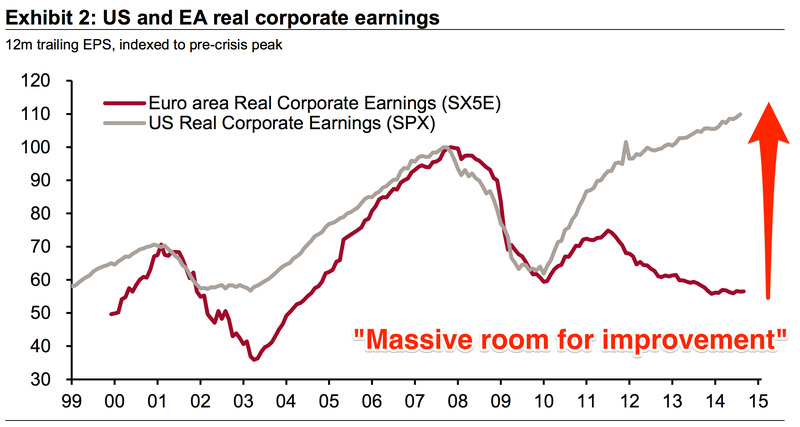 The huge gap between corporate earnings in the US and Europe hints at massive room for improvement. The massive room for improvement is clear in the bank’s base case for returns. Credit Suisse is expecting a 14% return from Eurostoxx 50 equities in 2015, with a massive potential upside. In the best-case scenario, they think returns could hit 25%. In comparison, their base case for S&P 500 stocks is an 8% return, with a 10% return as the best-case scenario. There is a clear downside: the worst-case scenario for Europe is much worse than for the US. But the European Central Bank is still stimulating the economy through quantitative easing (QE), which should be broadly good for stocks. There’s a huge potential for expansion if it goes for a full QE programme, which would involve buying government bonds, in turn, giving investors even more money to put into stocks. Credit Suisse is not alone. JP Morgan last night swapped US stocks from overweight to underweight (suggesting they deserve a smaller place in an investor’s portfolio) and raised European stocks to overweight.